these tables have been safety tested with 700 pounds in California to give them a 450 lbs Safety Rating, the highest in their class as most are only 250 to 300 lbs. Maximum user weight allowed is 280 Lbs due to liability reasons, if you are this heavy it could hurt your feet and ankles or possibly cause injury. having a 450 Lbs weight safety rating is just good piece of mind you are on a solid unit. Solid steel inserts on the back side of the wood so the hardware holds solidly and wont pull through, others can pull through thin plywood boards and particle board. Upgraded all the steel hardware (screws, nuts and bolts.) as many others are made with low grade steel, low grade steel hardware that can break or shear from constant movement over time causing collapse and injury. All the hardware is placed in an organized kit, others give you a bag of nuts and bolts to figure out yourself with a basic manual. Stopping pin system so you can find what position is comfortable for you. Revised new manual easy to understand with pictures added for easy, proper and safe assembly. A safety sheet is provided to be placed on or beside the Inversion table for all to see. 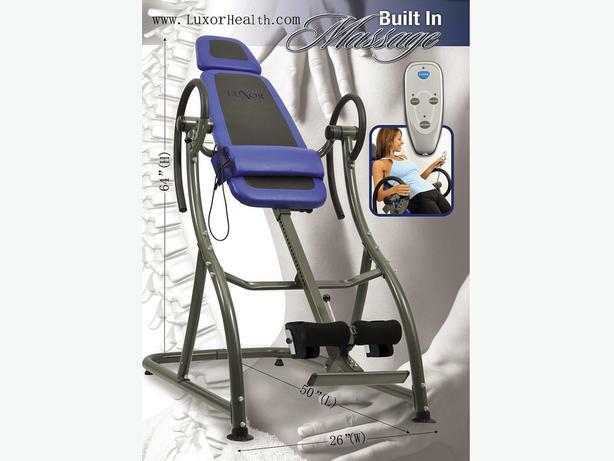 NEW FREE A/C powered back massager with a remote and added HEAT therapy, it is adjustable to position on the backrest. The pivot arms have now been welded to the spine of the backrest, this makes it even stronger, safer with easier and faster assembly.